Seventy-six (76) 'Warship' class diesels were built at BR's Swindon workshops (class 42s) and by the North British Co Ltd in Glasgow (the D6xx's and all of class 43) during the period from 1958 to 1962. Subsequently BR decided to adopt diesel electric type locomotives as standard and as a result the 'Warship' were all withdrawn from service after a very short life. Five of the 'Warships' (D600 to D604) formed a class on their own and as they and the class 42s were not regularly seen in Worcestershire they are not covered in this article. 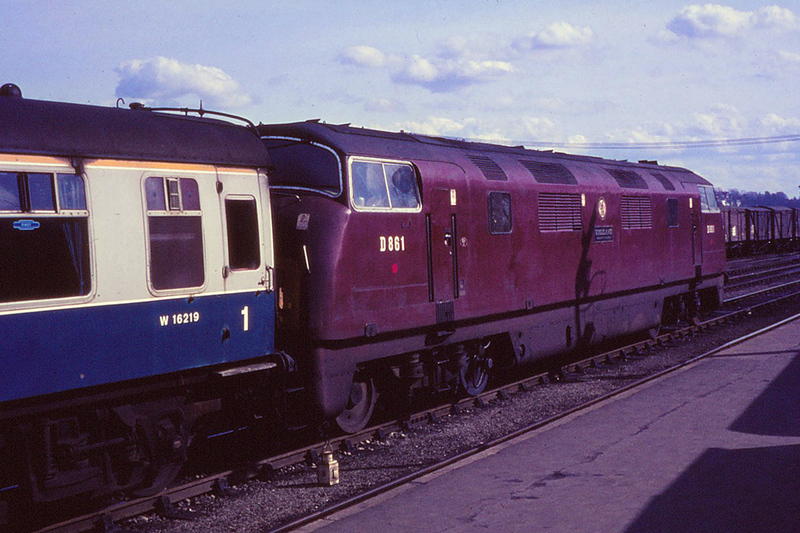 The main production series of 71 locomotives, numbered from D800 to D870 later became the class 42 and 43 locomotives. Nos.D800 to D832 and Nos.D866 to D870 being class 42 with Nos.D833 to D864 being class 43. All but two of the 'Warships' carried the name of Royal Navy ships. The two exceptions being No.D800 'Sir Brian Robinson' (Chairman of the British Transport Commission) and No.D812 'Royal Naval Reserve 1859-1959'. Phil Bullock notes that it was not easy to tell the difference between a class 42 and a class 43 but internally the 42s had Maybach engines and Mekydro transmissions whereas the 43s had MAN engines and Voith transmissions. D830 had a Paxman engine and Mekydro transmissions. 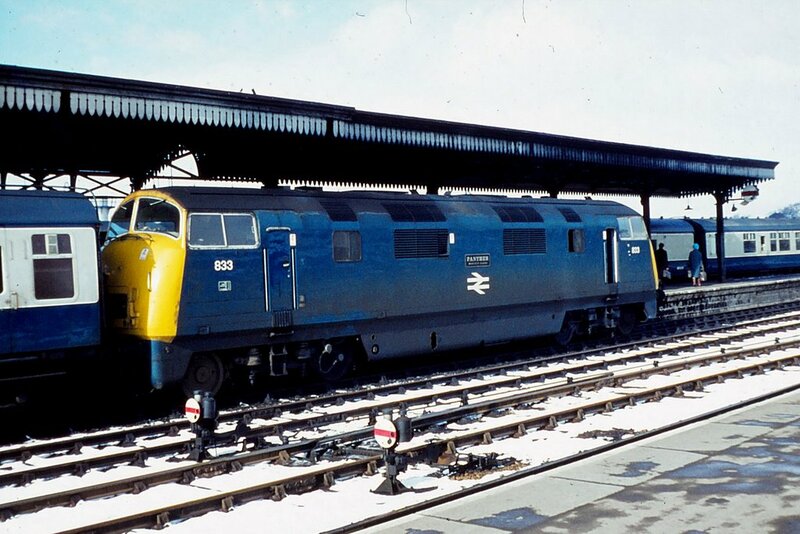 Towards the end of their working life (from Spring 1968) some of the class 43 'Warships' took over, from 'Hymek class 35's and class 47 locomotives, the operation of the services from London Paddington to Worcester and Hereford. 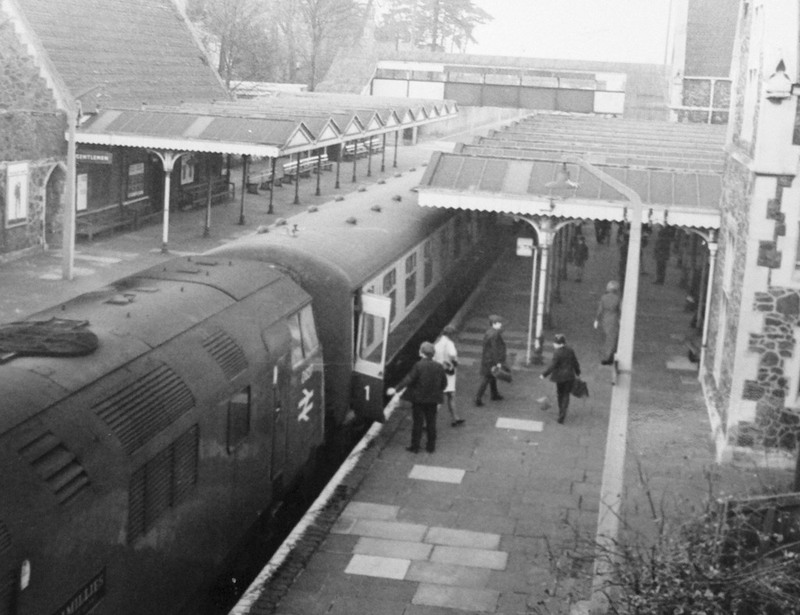 The last class 42 was withdrawn in December 1972 and the last class 43 in October 1971. Phil Bullock notes that in addition to the Paddington's another regular duty was train headcode '5B79' vans from Bristol Malago Vale or Temple Meads to Worcester Shrub Hill. 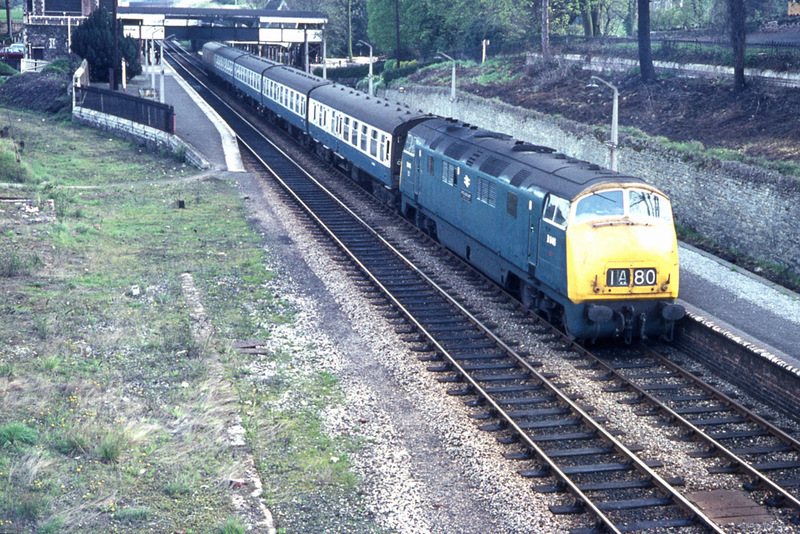 On 30th April 1969 'Warship' class 43 diesel hydraulic locomotive No.D846 'Steadfast' had charge of a Hereford to London Paddington express and was photographed by Robert Pritchard at Malvern Link Station. The locomotives took its name H.M.S.Steadfast which was a Minesweeper acquired from the USA under the lease/lend scheme during World War 2. It survived the war and returned to the USA in 1946. There had also been a World War 1 era Destroyer with the same name. The vacant land to the left hand side of the photograph shows part of the former goods sidings and includes part of the brick building that had recently been demolished. The siding to the right of the locomotive was subsequently filled in. In the late afternoon sun, maroon livery Class 43 diesel hydraulic locomotive No.D861 'Vigilant' is in the middle road at Worcester Shrub Hill with the empty stock for a London Paddington express train. It was photographed by Pete Wilcox on 26th March 1968. Photograph taken by Pete Wilcox. H.M.S. Vigilant is a name used many times by the Royal Navy and most recently for a nuclear powered submarine. No.D854 on 19th February 1968; No.D863 on 24th February 1968; Nos.D855 and D861 on 26th March 1968 (see photograph above); No.D860 on 13th April 1968; Nos.D848 and D858 on 15th June 1968; No.D847 on 22nd July 1968; Nos. D837, D850 and D863 on 22nd August 1968; Nos.D859 and D862 on 3rd September 1968; Nos.D834 and D850 on 8th February 1968; Nos.D839 on 12th April 1969 and Nos.D837 and D856 on 31st May 1969. Class 43 diesel hydraulic locomotive No.D837 'Ramilies' at the 'down' platform at Malvern Link. Photograph taken by Robert Cooke. Pete Wilcox took this photograph of No.D833 'Panther' at Worcester Shrub Hill on a very snowy 7th March 1970; the locomotive had presumably worked the 09.15 from London Paddington as it returned there at 14.15..
"I am always interested in new information on the NBL Warship workings on the Cotswold line in the 68-71 period. I attach the sum total of the bits and pieces I have picked up over the years if you wish to use this for the website then please feel free to do so. What I would request is that it is accompanied by a request for any further information and photographs of these fine loco's working on the line. I am happy for my email address to accompany any request and I am also willing to enter into correspondence with anyone who has questions or recollections. The Warships were my own introduction into the hobby as a 10 year old lad in Evesham in 1968. You can email Martin on m.j.street@btinternet.com. Right click here and use "save as" to download the file (pdf) to your computer.